Here’s another hack of the BurdaStyle Oversized Sweater pattern. This time as a tunic to wear over leggings. Once again I have used a wool/acrylic cable knit fabric from Textile Traders. I began this version with an already slightly hacked version of the pattern. It basically has just omitted the pockets and tapered in the sleeves. You can find further information about that here. Next I used this pre-hacked pattern and hacked it a little further! lol Because really, why not? First I reduced the width a little by folding in the back and front of the pattern as shown. I then altered the neckline using the Megan Nielsen Rowan bodysuit pattern. You can use a neckline from whatever pattern you like and this should still work. I have also used a v-neck on another version. 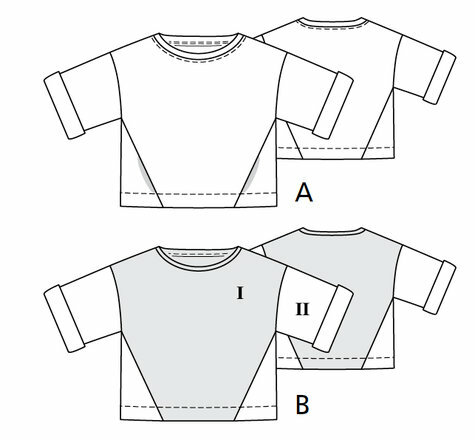 Ensure that the centre front is aligned and also the top of the shoulder at the neckline. The Oversized Sweater pattern has a low, sloping shoulder, so you may need to fold down the outer shoulder on the other pattern you have chosen to smooth out that shoulder line. I used my pre-hacked, tapered sleeve for this pattern. I decided on my desired sleeve length and folded the hem up. Once all your hacking is complete, You may want to trace over your freshly hacked pattern for future use! Then cut your pattern pieces out and add relevant markings. Now pin together the shoulder seams with right sides of the fabric facing.Sew together. I used my overlocker, but you can use a zigzag stitch also. Then press your seam towards the back. Make a small cut at the armpit marking. Sew your side seams from the small cut down to the bottom of your garment. Pin together the seams of the sleeves, right sides of fabric facing. Sew together and then press the seams to the back of the sleeves. Turn the sleeves in the right way. With the sleeves turned in the right way and the tunic turned inside out, place the sleeve inside the tunic. This will make the right sides of the garment facing. Ensure that you match the front sleeve mark to the front sleeve mark on the front of the tunic and the top sleeve mark with the shoulder seam. Pin together.Sew and press seams towards the garment. Finish the edges of the sleeves and tunic hem. Pin up the hem allowances and press. I used a 3cm hem at the bottom of my garment and a 1.5cm hem for my sleeves. Sew hems on the right side of the garment using a twin needle with low tension and if you desire, a walking foot. This will reduce the amount of permanent stretch that will occur when sewing. Repeat for the sleeve hems. Now for the neckband. Measure the circumference of the neckline. You can stay stitch around the neckline if you wish to limit stretching. I didn’t bother and it worked out fine. Cut a length of fabric that is 2/3 the length of your neckline. This fabric has a lot of stretch, so you may need to alter this if your fabric doesn’t have quite as much stretch. The width is entirely up to you. Just keep in mind that the width will be folded in half and requires seam allowance. Fold in half lengthwise and press. I usually pin my raw edges together to ensure my fold line stays put when pinning it to the garment. Fold the garment in half so that the shoulder seams of the neckline meet. This will give you the centre front and back fold lines. Pin or mark the centre front and back of the neckline. Fold the neckband so that the seam line is at one end of the fold. The front fold line will give you the centre front of the neckband. Pin or mark this. Match the centre front and back points of the neckband and the garment neckline and pin together. Stretch out the neckband and pin along the rest of the neckline evenly. It should have to stretch a lot. It is important to have this stretch so that the finished neckband will sit flat on your body and not warp. Sew and press seam allowance towards the bottom of the garment. At this point your garment is finished! Cut two pieces of fabric that are wide enough to wrap around your wrist with room left over for seam allowance. Double the desired length of your wristband and add seam allowance to each end. Fold your wristbands in half, ensuring the ribbing or stretch is going across the width of your fabric. Sew these side seams. This ‘tube’ should comfortably fit over your wrists.Fold these in half lengthwise. This is now the desired length of your wristband plus seam allowance. Pin to garment as if the wristband has been folded up towards your shoulder and sew. Press seam allowances and you’re done! I also made a tie to go with. It was simply a long rectangle of fabric with the lengthwise seams sewn together. Sew one end of the tie together. Then turn in the right way. Stitch the other end of the tie together and press.